The air of many buildings and homes will contain many pollutants and chemicals. These some from cleaning products, furniture, building materials, and some other sources. Flooring materials like carpet are one sources of chemical pollutants. Flooring materials may contain formaldehyde, which will seep into the air. This is probably the most common household pollutant. In moderate doses formaldehyde will cause repertory problems, eye irritation and constant lethargy. Some people are more sensitive to formaldehyde than others, though all people will suffer if the exposure is more than moderate. Individuals with allergies may find that the formaldehyde will aggravate the allergy. There is not positive aspect to chemical exposure. So it is best to keep the chemicals content of the air as low as possible. Polyurethane protective floor coatings will release some chemicals into the environment. It is best to let these coating air out for a few days before using the room. Most other floor materials like carpet or synthetic products will release chemicals into the air when they are first installed. Always air out rooms when the home is new or after renovations. New carpet are renovations, as is fresh paintwork. Open windows and doors in the home or renovated room, use fans to circulate the air. Cover new carpets with bi-carb of Soda for a few days, then vacuum. Indoor plants help clear the air. And they require minimal maintenance. Use environmentally friendly cleaning products whenever possible. Never mix chemical cleaners- this can create toxic compounds. Store chemicals in a ventilated outdoor area. Install exhaust fans above stoves, and in bathrooms and toilets. Natural timber flooring is one of the most environmentally sound building materials. Timber contains no artificial chemicals and will cause no health problems. Timber can be re-sanded to restore its original appearance. 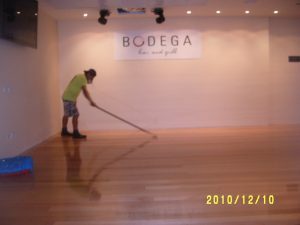 Timber floors will easily last a century even if they are re-sanded every decade.